Friend or nemesis? 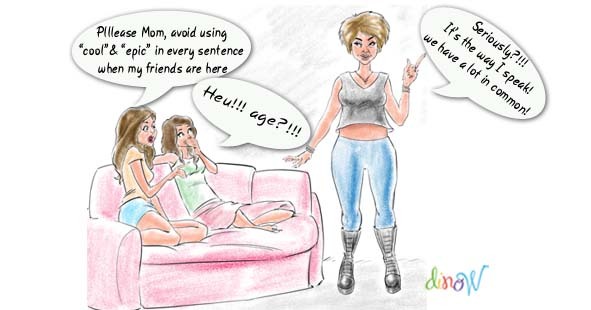 This age-old dilemma between mothers and daughters starts in our teens. The love/hate relationship, the irritation, impatience, bad temper and unnecessary hurtful retorts we keep on showering them with will recede, as we grow older but the irritation will persist. Why? On one hand our moms will always feel like moms and will go on “asphyxiating” us with their wisdom, know how and advice no matter how old we become, on the other hand, we resent the fact that they are almost always right. We are allergic to their perpetual interference in our lives and families even when they don’t talk. The silent treatment and the sting of their disapproval are even worse than actual words. We often forget that they only do it because they care. But the tormentor will turn into a victim as soon as the daughter becomes a mom and her kids reach their early teens. Nowadays, by the age of 7, children start acting like teenagers. Trends and technologies are moving so fast that mothers have barely the time to catch up. The younger the generation, the more technology savvy it is. Try typing as fast as any child on any device or learning and following any game, song etc…Parents are outsmarted in these fields and children are critical about any person who can’t keep the pace. Mothers have to follow the progress or be left behind. The new generation of mothers is overwhelmed by the speed at which the world is developing and moving globally with the social media opening the world to everyone. They have to stay up to date to earn some respect from their kids. They do everything by the book, follow all healthy recommendations, keep up with their children’s education, diet, exercise, take care of their families and manage to have high-profile careers. For all these efforts, do their kids treat them better? Not a chance! For some it’s a pure nightmare. Children have become even more cunning and judgmental. They are showered from everywhere with information and are, by far, more knowledgeable than their parents were at their age. Most of them are spoiled and arrogant. They were given too much too soon and were not expected to give anything in return. And mothers? So desperate to belong and to fit in that sometimes they become pathetic. ← Teta Sucre (Grandma Sugar) & Nicolas’ prank!